Below is a “GENERAL” idea of what a clean up crew should consist of based on the size of your tank. MINIMUM “CUC” – Recommended for a standard tank with low bio load, low nutrient levels, low levels of algae and waste, and overall very stable. FULL “CUC” – Recommended for heavily stocked tanks with a large bio load, excess or excessive algae growth, excess waste, or heavy feeding habits. Also recommended when trying to get an existing algae problem under control. Although I do not recommend Sea Hares in small tanks due to the fact they can release a toxin which can affect coral, inverts and fish, I do like these in 75g+ aquariums. They are extremely good sand cleaners, and do a good job on rock and sometimes glass also. Great additions at about one per 75-150 gallons. Tiger Tail Cucumbers may disappear during the day, but are active all night. Sand becomes spotless, and all the extra waste from the day gets consumed. Great additions at about one per 50-100 gallons. Fish are rarely thought of as part of a clean up crew. 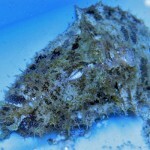 But when it comes to algae control, few can compete with the appetite of a Lawnmower Blenny. These blennies are excellent at removing a hair algae problem or most other nuisance type of nuisance algae that may develop. One blenny per tank usually does the trick. 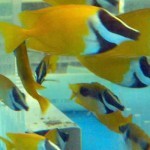 The Foxface (although not 100% reef safe) usually prefers a diet various algae’s. These bright fish liven up an aquarium while destroying hair algae, along with several other types. A good option for an aggressive tank also. One per tank, unless tank is 180+. 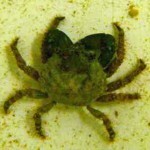 Although the Emerald Crab sometimes has a bad reputation, it is great at bubble algae control. 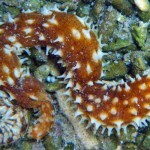 It is one of the only species available which will eat bubble algae. They are also great scavengers. The bad reputation comes from the whole crab family being opportunistic feeders, meaning if its hungry it will eat whatever it wishes. 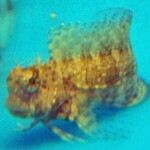 Recommended one per 15-25g in an established aquarium. Peppermint Shrimp are primarily known for their aiptasia (glass anemone) appetite. 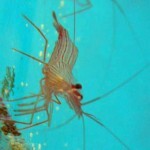 These small shrimp are also great scavengers which hide most of day and search for food most of the night. Strongly recommended for heavily fed tanks, and tanks with a lot of rock work for food to get stuck in. Recommended 1 per 10-25 gallons. 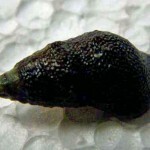 Nassarius Snails are sand dwelling snails which are extremely active scavengers at night. They are also fun to watch as the tank gets fed they rise from the sand like “zombie snails”. Overall a great scavenger to have. Recommended 1 per 2-5 gallons on average. Cerith Snails are a good all around snail. You will usually find them during the day either buried in the sand or resting at the waters edge at the top of the aquarium. These snails seem to have no preference on where to eat, and you can find them on your rock, glass, and sand. Recommended 1 per 1-5 gallons. Nerite Snails are great at handling film algae, cyanobacteria, and diatoms. These snails which stay small even when full grown will be seen mostly on the glass during the day grazing, and all over your tank at night. Recommended 1 per 1-5 gallons. 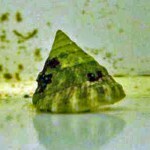 The Turban Snail (or false Trochus) are a good snails for film algae, cyanobacteria, diatoms and can be found eating from the substrate, live rock and tank glass. 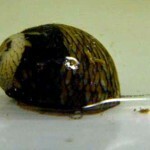 Although not its primary choice, the turban snails “may” also occasionally graze on hair algae. Recommended 1 per 2-5 gallons. Turbo Snails live to wipe out your algae. 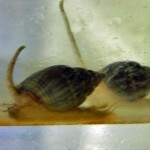 These large snails forage some of the day and night in all parts of your aquarium. Although big and can knock around corals and live rock, nothing can match its appetite. Recommended 1 per 10-25 gallons. Hermit Crabs are great scavengers for anything unwanted in the aquarium (waste, algae, excess food, etc). The down side is hermit crabs need to get their shells from snails. It is recommended to keep a few extra empty shells in your aquarium to help cut back on snail loss. Recommended 1 per 5-25 gallons. 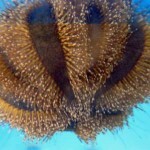 Urchins are a great way to control algae in aquariums with aggressive fish where snails are not an option. Most urchins hide during the day and forage at night. Recommended (depending on species) 1 per 50-100 gallons.